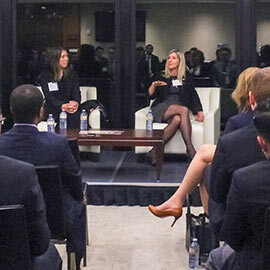 On Dec. 2, 2015, the Bay Street Investment Club (baySIC) held its final event of the year in partnership with the Wilfrid Laurier University Alumni Association (WLUAA), focusing on disruptions and trends within the domestic and international investment management industries. Hosted by baySIC cofounder Nimar Bangash (BA `11), the panel featured three of the investment industry’s top executives, representing some of the foremost asset management shops. Heather Cooke, baySIC’s resident institutional asset management expert, is the head of Institutional Clients at Unigestion, a boutique Swiss institutional money manager. Robert Strickland (BBA `83), is the president of Fidelity Investments Canada and brought decades of insight to the panel, and Leah Brock (BBA `90), executive vice-president at Bridgehouse Asset Managers, rounded out the panel providing insight and expertise on the full gamut of asset management trends. The panel first provided an overview of investment trends and expectations going forward, and then moved on to discuss technological disruptions, regulatory changes, and operational changes as they relate to the industry. The panel then provided their insights into what opportunities will exist for future asset management professionals. Heather stated the growth of both liability-driven and alternative investing have created more opportunities for those with a broad knowledge in the areas of risk management, a variety of asset classes and both quantitative and fundamental investment techniques. Leah commented that as the asset management industry continues to grow, its good news for those with operations and business management skillsets considering industry-wide efforts to reduce costs, increase efficiency and remain competitive. Rob urged the audience to consider careers within investment management sales specifically, pointing to the transferable skills to any role within the broader investment management space. For a full event recap, visit the baySIC website.